A provocative six-seater ‘Lip Bar’ designed by Japanese artist Daido Moriyama has gone on sale at luxury London department store Selfridges for £80,000. Launched in time for Valentine’s Day, the bar, which claims to be the world’s smallest, features a recurring lip motif based on a photo by Moriyama. Best known for his gritty black-and-white photography, Moriyama’s London bar is inspired by the tiny drinking dens in Golden Gai, an area of Shinjuku in Tokyo. 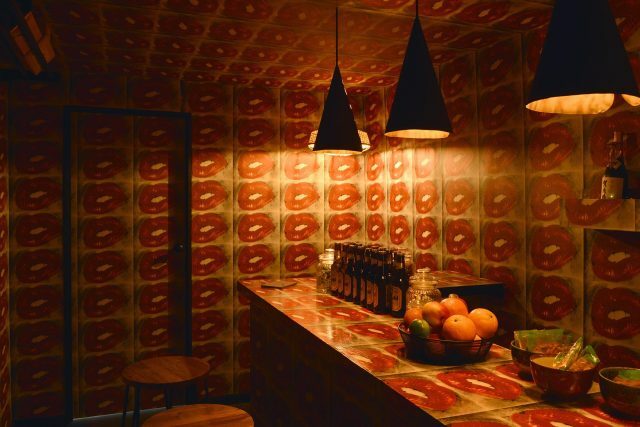 Moriyama also designed a similar space, Bar Kuro in Tokyo, which boasts his red lip design. His dimly lit, five square-metre London speakeasy can be booked by singletons looking for love this Valentine’s Day. An hour at the bar costs £10 and includes two Asahi beers, sort drinks or a cup of saké for you and your paramour. While the Lip Bar is designed as a space where singles can meet and mingle, couples are also encouraged to swing by. The Lip Bar will be open until March 3, and can also be bought outright for £80,000 as part of Selfridges’ State Of The Arts campaign, which showcases installations, limited-edition pieces and in-store displays at its UK stores. Those keen to delve deeper into Moriyama’s work can check out his black-and-white photos of Japan’s street life on display at Selfridges’ Art Store, which brings together works from renowned galleries like the White Cube and Gagosian. The department store’s three-month State Of The Arts project, which launched last month, promotes the work of nine different artists. If you’re not able to score a seat at the Lip Bar, London has plenty of other diminutive drinking dens to explore. Not the world’s smallest, there is a Bar in Melbourne, Docklands, Australia, it has room for 4 people only and is only 26sq feet in room, that’s 2m long and 1.3m wide, maybe you should Check it out, It’s called Le Bar Europeen.